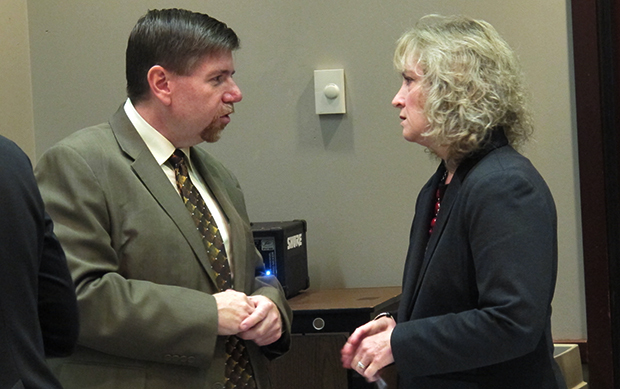 State superintendent Glenda Ritz speaks to State Board of Education member Brad Oliver after returning from a recess during which her staff and representatives of the Center for Education and Career Innovation hashed out a motion for the panel to approve a conceptual framework for a new A-F grading system. The State Board of Education gave its blessing Wednesday to the conceptual framework — but not the substance — of a new method for issuing letter grades to Indiana schools. 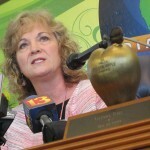 In nominally meeting a legislative deadline for re-writing the system, board members also expressed skepticism with several of its proposed elements — including, potentially, the addition of new statewide tests in first, second and ninth grades that officials would use in calculating schools’ grades starting in 2015. But the board’s 9-1 vote did relatively little, simply adopting a 100-point scoring scale for tabulating grades — one of dozens of changes an appointed panel of educators recommended in its report earlier this month. Lawmakers threw out the model state officials used to calculate last year’s grades during the last legislative session, rejecting the notion that state officials should compare a student’s academic growth to the growth of her peers in determining a school’s grade.